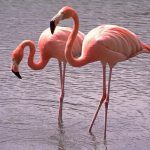 Flamingos are large birds with long, stick-like legs and long, slender necks. 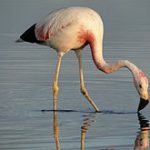 Flamingos are wading water birds, inhabiting alkaline, saline and/or estuarine lagoons and lakes (usually lacking in vegetation). 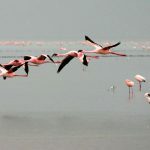 Flamingos are not a migratory bird; there are six known species, which can be found in a variety of places. 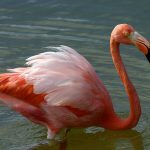 Yes, it’s true… flamingos are pink due to the food they eat. They eat insects, invertebrates, small fish, and algae. They stir up food from the mud with their feet, and hold their breath whilst they duck under water to catch a meal. The algae they eat is full of beta carotene (also in foods such as tomato, carrot, sweet potato causing the colour) which causes the pink colouration, as well as carotenoids in the molluscs and crustaceans they consume. 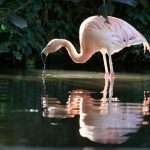 Depending on the levels of the carotene and carotenoids in the foods available in their habitat, will determine the shade and brightness of the Flamingos colouration. 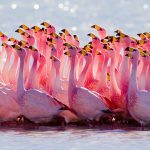 Flamingos are born white/grey and turn a pink-colour at around two years old.